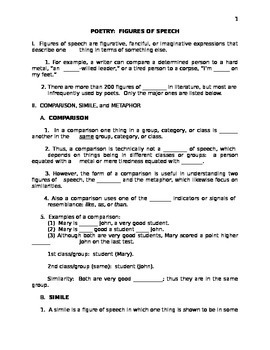 A five-page, fill-in-the-blank handout which provides definitions, examples, exercises, and other activities on the major figures of speech used by poets: simile, metaphor, the poetic apostrophe, personification, paradox, hyperbole or overstatement, and understatement. Many of the examples, exercises, and activities incorporate the language of your students’ everyday life (love is a roller-coaster ride, Smartphone, the movies "Avatar" and "Monty Python," the paradoxical “youth is wasted on the young,” etc.) so that they will see how they hear and use figurative language everyday without realizing they do. For example, the student handout closes with a typical situational activity where eight students, trapped inside by a rainstorm, comment wittily to each other about the situation. Of course, each uses one of the figures of speech. Example: “Nature woke up in a bad mood today.” Your students, working alone or in a group, will decide what figure of speech is used and frame a justification for the answer. 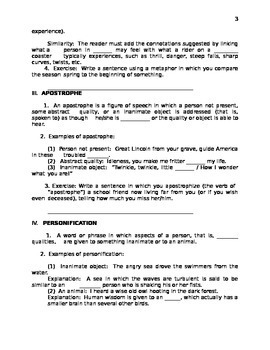 An Answer Key to the student handout begins on a separate page. 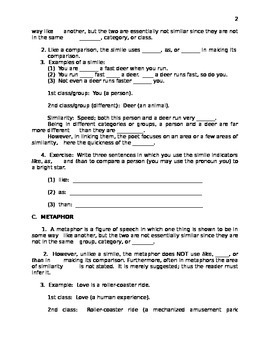 I have also appended three pages of “notes to teacher,” which contain additional figurative-language activities to augment those in the student handout in case you believe your class needs extra work. Prepared by Professor William Tarvin, Ph.D., who has published many articles on literature in scholarly journals.